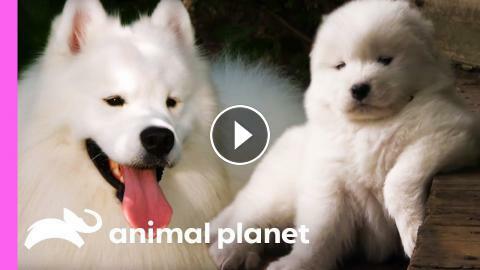 ﻿ Fussy Samoyed Puppy Makes An Unlikely New Best Friend | Too Cute! Seymour the fussy little Samoyed pup just wants to find someone to give him all the attention he deserves. He finds an unlikely friendship with Bon Bon the Dalmatian, who finally gives him the attention he's been looking for. Puppy Goes for a Spin | Too Cute! A Playful Swim for Puppy and Hedgehog | Too Cute! Puppy Hiccups | Too Cute! Five Cutest Puppy Piles | Too Cute!